Get the exclusive content you crave straight to your inbox. 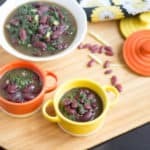 A vegetarian food blog with unique and interesting recipes from all over the world mainly focused on South Indian Cuisine. Sambar Vadai – the crispy deep fried savory snack soaked in the hot piping lentil sambar is one of my favorite comfort food and I can enjoy it for any meal. The crispy vada, when soaked in sambar, becomes super soft and melts down as you chew it and the taste of the sambar vada depends completely upon the sambar. (Obviously right?) 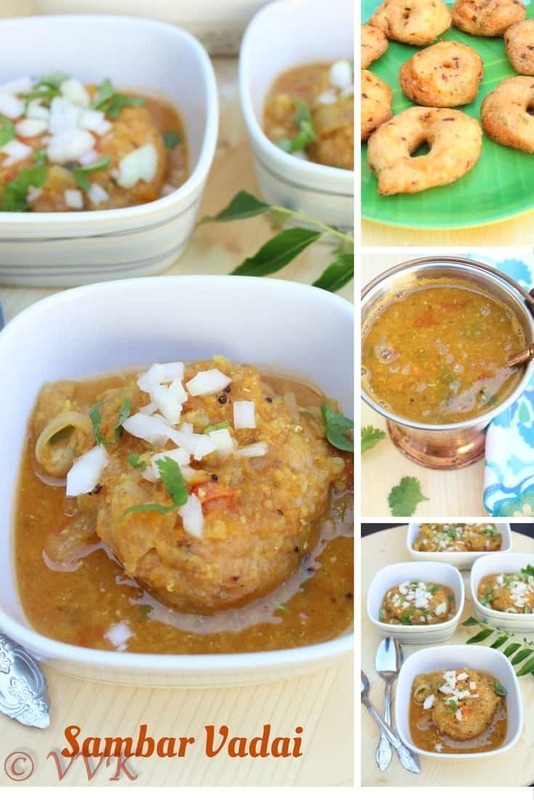 Here come my tiffin sambar version 3, and the sambar vadai recipe with step wise pictures. Apparently, this is my 30th sambar variety post. :-) I wanted to post this recipe for a long time. This is my all-time favorite sambar recipe. So what makes it so special? I have mentioned in my blog before that Revathy Shanmugam is one, my favorite chef. I am always amazed by her way of presenting the recipes in a simple way and needless to say about the tips that she explains during the preparation. I pretty much watch all her shows and this sambar vadai recipe and the sambar recipe is from one of her show “Arusuvai Adu Thani Suvai”. Her recipes never failed me and here is my version of sambar vadai adapted from hers. When I make a plan to make sambar vadai, I also plan for the thayir vadai. Oh yeah, tomorrow’s recipe is thayir vadai. I usually soak 1 cup of urad dal and prepare the batter as I mentioned in my urad dal vada post. But before adding onions, I divide the batter into half. For thayir vadai, we don’t need to add onions whereas for sambar vadai we need onions. So one half of the batter is for sambar vadai and the other half is for thayir vadai. To the sambar vadai batter, I add cilantro and onions and fry them in a regular way. Let me talk about thayir vadai tomorrow. 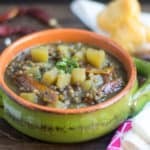 This sambar is super simple and doesn’t call for any exotic ingredients. The secret ingredient here is the pumpkin and the trick is to cook the pumpkin along with dal and mashing it together. 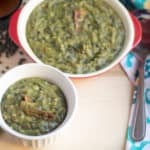 As masoor dal is easy to cook, I always opt for masoor dal. So this tiffin sambar is with masoor dal. I have tried cooking dal with carrots for this sambar and it has come out really well. Sometimes I include a small piece of jaggery even after adding the sweet veggies. This sambar goes well with any tiffin items and also this is perfect for sambar idli. Once the vadai and sambar are ready, assembling sambar vadai is super simple. All you need is piping hot water to soak the vadai first. This makes the vada soft and also helps to absorb the sambar. I followed the ulundu vadai recipe that I posted during this April BM. If using tamarind, soak them in 2 cups of water for about 30 to 45 minutes and extract 1.5 cups of tamarind water. If using paste, dilute the paste in 1.5 cups of water and set aside. Chop all the veggies and if you are using frozen drumstick thaw it to room temperature. 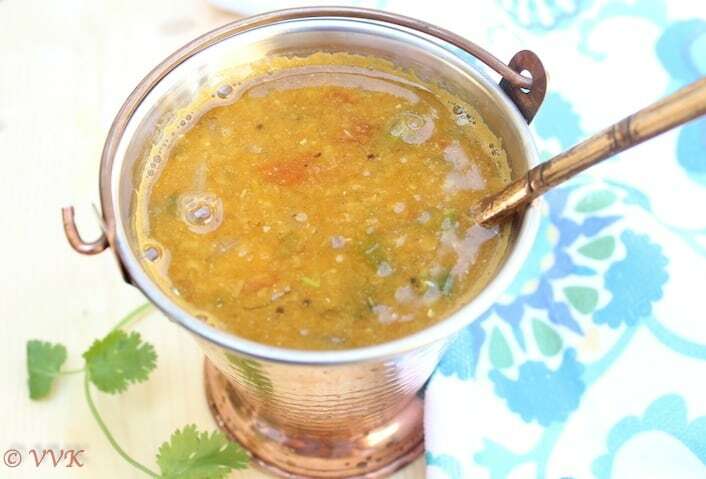 Wash the masoor dal and pressure cook it along with pumpkin and turmeric powder by adding 1.5 cups of water. Once the pressure is gone, mash them well. We need the pumpkin to be pureed. Heat the kadai and add oil. Once the oil is hot, add the mustard seeds, methi powder, and hing. Saute for a minute. As the mustard seeds, starts to splutter add the curry leaves and chopped onions. Cook until the onions turn translucent. Now add the tomatoes and cover and cook for 3 minutes. When the tomatoes are slightly mushy, add the drumsticks and the tamarind water. Add salt and let it simmer for about 5 minutes. Now add the sambar powder in 1/2 cup of water and mix well and make sure there aren’t any lumps. Add this to the sambar. Let it simmer for 5 more minutes. Now add the masoor dal pumpkin mix and check for salt. If required add more and simmer it again for 5 minutes. Add the chopped cilantro after five minutes, bring it to one and turn off the heat. That’s it. Sambar is ready. 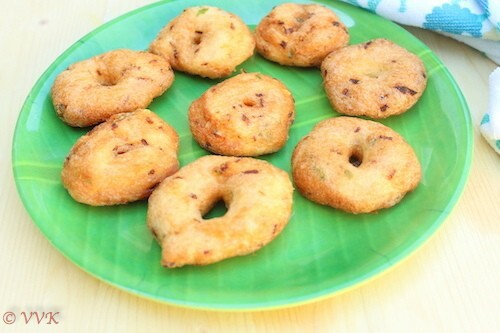 I have included the detailed step by step recipe in the vadai post. Boil the water and make sure the water is hot. Now pour this hot water on the vadai and let it sit for 15 minutes. This is the key step and this makes the vadai super soft. After this take this soaked vadai and place them in your serve ware. Add about 1 cup water or more on each plate. Ensure the vadai is soaked in sambar. Now drizzle some chopped onion and cilantro. Add a dollop of ghee and serve hot and enjoy!!! We love masoor dal, so I am opting masoor dal these days. But the original recipe calls for toor dal. Instead of pumpkin, carrots can be boiled and I have tried that. Basically, we need a sweet veggie. Adjust the salt and spices as per your preference. The water that you pour on the vadai should be piping hot. Once the oil is hot, add the mustard seeds, methi powder and hing. Saute for a minute. Now add the sambar powder in 1/2 cup of water and mix well and make sure there aren't any lumps. Add this to the sambar. That's it. Sambar is ready. Add about 1 cup water or more in each plate. Ensure the vadai is soaked in sambar. I love sambar vada. Yummy!! Yummy!! I love sambhar vada to the core. It looks so delicious. Thanks Pradnya. Let me know how it turned out. 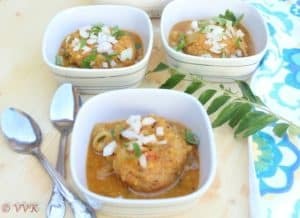 This is our favorite Saturday night dinner and love making it often!..very nicely done..
Vidhya I have had my dinner right now but this yummy sambhar vada is making me hungry yet again. Its delicious nad I hav ebeen planning to make it for ages now. Maybe for diwali. :-) :-) Thanks and please do try. Love this delicious sambar vadai. Adding pumpkin to sambar sounds yummy, will have to try it out some time. Please do try it Pavani. Thanks Much. Sambar Vada looks SO good!! Perfect for dinners. 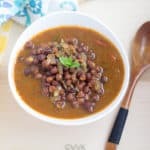 One of my favorite,amazing recipe.I love Revathi Shaumugam’s recipe and like the way she cooks each and every dish with so much dedication and perfection..
Oh yeah.. I love her shows and of course her recipes. 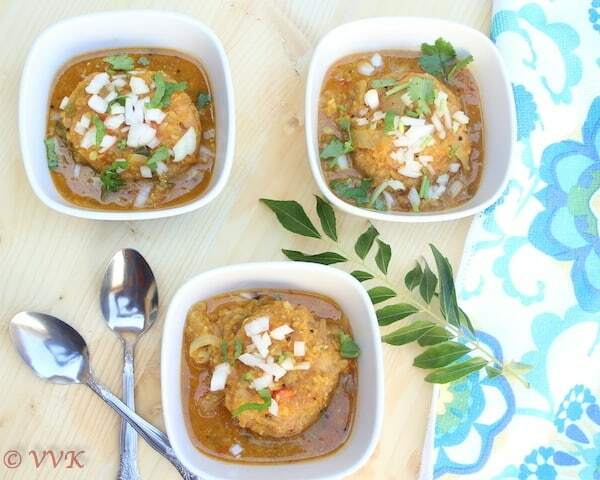 Yummy vadas dunked in that flavorful sambhar sounds like an ultimate treat. Oh wow..love those vadas dunked in sambar..absolutely fantastic . Wish I could grab a bowl right now! YUMMY! Very tempting. Love the combo. Yumilicious sambar vadai love it !!! plz visit my blog too and share your valuable comments. Thank you. Omg, gal this post is seriously very much tempting, am keeping myself away from deep frying and this vadais makes me drool. :-) Thanks a lot Bikram. Even I like Revathi Sanmugam’s recipes. This sambar vadas are one of my fav. Your post is making me so hungry.. Her recipes are great naa. :-) Thanks Gayathri. 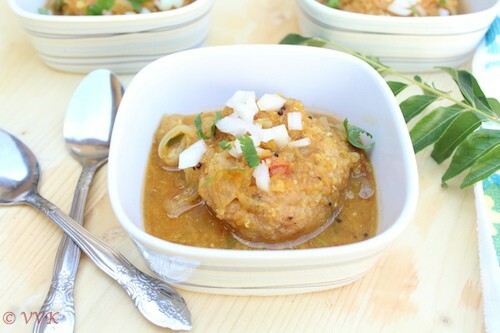 Sambar vada is a nice combo and can be served for any meal, breakfast, lunch or dinner.